Zlarasi – Level Six aqua-farmers living in the oceans on Alagara. 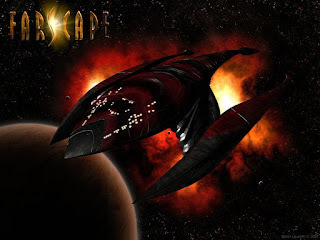 They use two ships: Conch ships (mass drivers) and Diamond warships (anti-matter core and weaponry). Creating such ship concepts is a lot of fun! 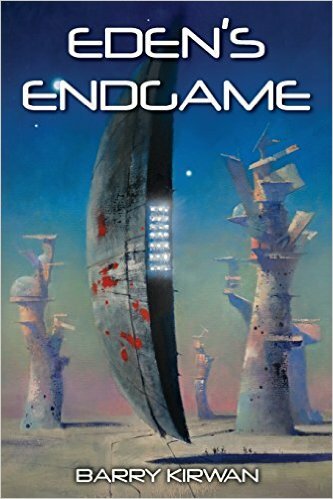 But even better, when commissioning the cover for Endgame with celebrated SF artist John Harris, I got to design the ship Shiva with him (well, technically the Scintarelli designed it, we just visualized it, lol). I sent him the chapter where Shiva goes into action, and he produced the cover, first in pastels and then in oils. Needless to say, it's on my wall! 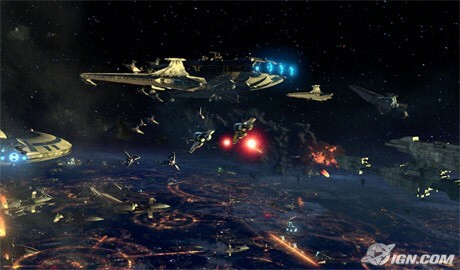 Micah focused on the foreground, in particular the Ossyrian Diamond ships, and addressed Vashta. Micah was about to apologise, when Sandy interrupted. 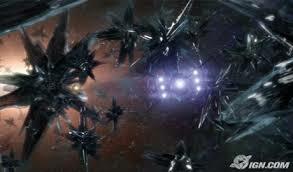 Micah nodded, relieved to see a fleet of black and purple Spikers enter the system. Micah did, they reminded him of scorpions. Micah peered at the viewscreen and at first saw nothing, then massive Transpace conduits opened, revealing snake-like ships in the lead that rippled aquamarine. Shiva informed him they were Zlarasi Serpent-ships. He knew what Kilaney had done to them, destroying their home planet in order to salvage Blake, and was about to ask Sandy to contact their Commander when the Zlarasi commander opened a channel. Micah was relieved, and wondered whether humanity would have been so forgiving had the roles been reversed. Wagramanian Hammer-ships arrived, behind the Zlarasi Serpent-ships, and Micah recalled that the Wagramanians – the first to be recoded – had recently been restored. When he saw what they were towing, however, he stood and walked up to the viewscreen. He doubted they would perturb the Nchkani vessels, and Qorall could use his black hole to swallow any amount of matter spewed in his direction. Then he remembered something; the worms, whose natural habitat was the inter-galactic void, could excrete anti-matter. That might make a difference. Of course. Micah kept forgetting that humanity was just a pawn, and there were more skilled players. Xenic replied in Mannekhi and broke the connection. Micah glanced back to Sandy for a translation. After a second she looked up from her console, a small smile on her face. “He’s been reading up on Earth culture. ‘Only the good die young.’” Her voice caught on the last word, and she locked her face onto her displays again. Micah focused on the arrays of ships again, imagining a gigantic chessboard: Hellera and Qorall at opposite ends, their armies lined up ready for the battle, waiting for one or other side to make the first move. He had a feeling it wouldn’t be particularly subtle. A klaxon sounded aboard Shiva as Qorall dispatched three waves of Tazani battle-cruisers and attendant fighter ships towards Hellera’s position. The Wagramanians launched the worms – presumably anaesthetized – towards the first wave. Three Hammer-ships skulked behind each dark worm, hidden in the giant folds of the creatures. Micah zoomed in on one, and saw a pulsing green cable protruding from the worm’s neck; the Zlarasi were controlling them directly. Mannekhi Spikers accelerated towards the attacking front, over-taking the worms, their purple spines spitting fire at the Tazani. In return, each of the Tazani ships’ two prongs forged a beam between them that launched lozenges of energy at the Spikers, ignoring the worms. Space lit up like a firework factory exploding, but without sound. Shiva filtered out the glare. Micah saw the Mannekhi suffering heavy losses, many of the Spikers blown apart by the energy impact, spilling Mannekhi into space. None of the Mannekhi ships retreated, and nausea gripped Micah’s stomach. But as the worms reached the centre of the battlefield, the Wagramanian Hammer-ships engaged, living up to their name as they spun like tomahawks towards the less manoeuvrable Tazani battle-cruisers, weathered the defensive energy lozenges, and smashed headlong into and through the cruisers. Once a Tazani cruiser was damaged, Spikers descended on it like vultures, to finish the job. Bronze ships that looked like giant squid entered the fray, and Shiva tagged them as Level Eight, Hushtarans. They began capturing the Wagramanian Hammers with long tentacles of antimatter, burning their way through the Hammers’ fuselage. Hellera deployed the Ossyrian Diamond ships. Micah didn’t actually know what weapons the Ossyrians possessed, only that they had once been feared across the galaxy. The crystal diamonds approached the squids and split into two pyramids, then began cutting the squid, slicing through its hull, twisting and turning, the two halves of the diamond working together, gouging and dismembering the ship. Soon the Hushtaran ships were listless in space. Micah zoomed in to one that was in pieces, but detected no bodies. Shiva informed him that Hushtaran pilots merged organically with their ships; they were one and the same. Micah knew this battle, though terrible, was all a preamble to the real one, and at the moment a ploy by Hellera to get the Nchkani vessels to enjoin battle. But it wasn’t working. Instead, Qorall fired his famed spatial lightning bolts, criss-crossing the space with green plasma arcs of awesome power. Any Spikers, Diamonds and Hammers that didn’t make it quickly enough to the leeward side of the worms were vaporised, as were the remaining Tazani and Hushtaran ships, evidently collateral damage as far as Qorall was concerned. Micah prayed that Xenic was still alive. Micah stared at her awhile, and realised that whatever happened here today, whoever won, ten million years of ordered Grid Society was going to be torn down. He wondered if Hellera knew, and then decided that of course she knew, she was Level Nineteen. The Rangers’ assortment of small scout ships swept in like fireflies, dodging the green lightning bolts with faster-than-eye movements, and for the first time Micah appreciated how physically robust the reptilian Rangers must be to survive such manoeuvres. Still the Nchkani hung back. Instead, hundreds of copper-coloured vessels shaped like corkscrews appeared out of nowhere, reminding Micah of old-style solenoids. For the first time ever, he felt a jab from Shiva via his resident, and guessed it was her equivalent of a flinch. He interrogated, and Shiva replied: . Micah paced the length of the screen, thinking. Unknown and some kind of stealth tech. It only made sense if Qorall had concealed them all this time, during nearly twenty years of war. The discipline behind his strategy was breath-taking.